I read this after having seen the movie, which I loved. This original telling of the story is a bit more nuanced, providing more background into the relationship between Simon and his friends. As is usually the case, as much as I enjoyed the movie, I enjoyed the book even more. Not quote as tidy a story in written form, and therefore that much more meaningful. 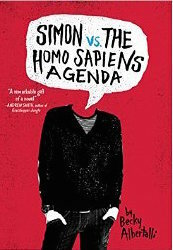 Sign into Goodreads to see if any of your friends have read Simon vs. the Homo Sapiens Agenda.